All data taken from Metrolist, Inc, on August 13, 2018. Denver, Colorado. The Denver housing market has reached record levels price wise and is showing signs of slowing down in appreciation. The recent positive data has clouded the fragile upcoming trends in housing for Denver. When the number of properties currently under contract continues to drop month over month, that is a leading-edge indicator of slowing sales and prices for future months. Investment opportunities in Denver single family housing market will offer less upside than the previous 5 years, but most certainly are still a bargain compared to renting due to low interest rates. The housing market’s appreciation of the past five years has turned to near euphoria, at least based on the performance of the sold data from 2013 to 2018, as further evidence is pointing towards a gradual slowing down of the market. The 8-10% appreciation is un-sustainable and we are beginning to see signs of a more normalization of the Denver real estate market. 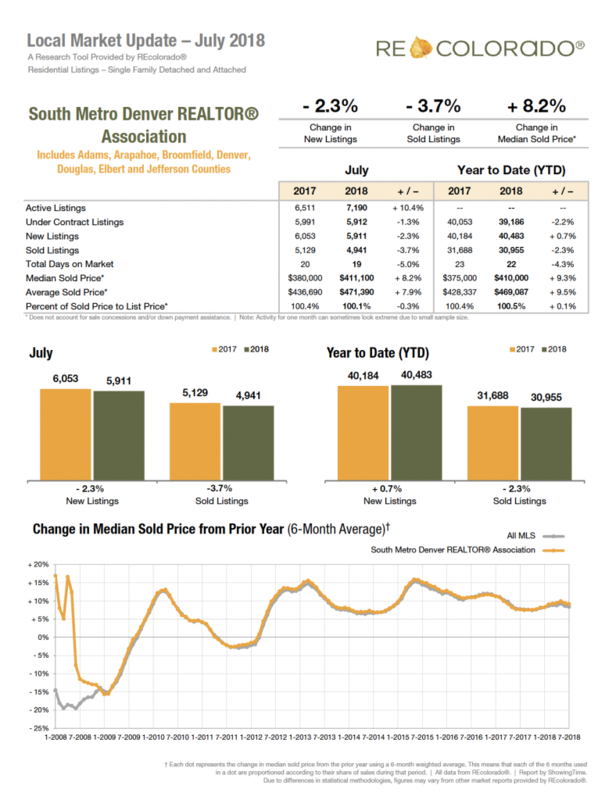 July 2013 to July 2018 there was a 41.11% increase in sales price for attached and detached family homes in metro Denver that went from $334,067 in 2013 to $471.390 today. Historically most ten-year periods would increase 30% and we’ve outperformed that in 5 years. The number of attached and detached homes sold in 2013 was 54,661. In 2018, we are predicting to see approximately 53,000 attached and detached homes close or a 3% decrease in sales numbers over 2013. Seems like a relatively small decrease compared to the appreciation number, but this trend does show we are normalizing the market. Can the Denver housing market sustain 2% increases in sales year over year for another 5 years? Will Denver housing revert to 2013 price levels over the next year or two, which in 2013 showed a 5.6-month supply of homes and appreciation of 3%? Will the average price of a single-family home rise approximately 8% by next July like it did the last 12 months? The Denver market continues a strong position for sellers as of today and is still one of the best reasons to consider Denver real estate as a solid investment. The opportunity for appreciation since inventory levels have continued to reduce remains in place. We would predict inventory levels starting to rise over the next 12 months, as the buyer pool is shrinking. Single Family home inventory is 10.4% higher than July of 2017. Single Family homes Days on the Market is the same as 12 months ago. Single Family average price of $471,390 for the month of July is 7.9% higher than July of 2017. The significant drop in single family inventory has fueled the 2018 Denver real estate market sales in 2018 along with low interest rates. As single family inventory rises sales will slow down and not be able to sustain 8% growth year over year. Denver will experience a 3-4% average price increase over the next 12 months. The lower amount of inventory will prevent a collapse of housing to lower levels as demand has remained consistent due to low interest rates. Know the numbers of sales and prices in the neighborhoods you are searching for homes. Study the trends of the price range you are buying within to make the best deal possible for you. Improve your housing information on all Online sites as buyers are looking to Realtor.com, Zillow and Trulia. Make your home sparkle from the street throughout the entire home. Know the price trends for your home. Overpricing is a mistake in today’s market.